In addition to being a frequent contributor to NBC’s “The TODAY Show,” he is also the author of two books (America the Edible, Straight Up Tasty), and his production company, County of Kings, co-created and co-executive produced “BBQ Champ,” a wildly popular competition series, for ITV in the UK. A Yale graduate, Adam speaks four languages and has traveled the globe - visiting 13 countries alone for season two of “Secret Eats with Adam Richman” - on his quest to highlight local food culture on a national stage and uncover the world’s hidden edible treasures. Long before discovering his thirst for travel, Adam had access to authentic delicacies from around the globe, all within the borders of his diverse Brooklyn neighborhood. However, it was cooking a plain cheese omelet with his Aunt Anne that became a defining moment of his early years. Watching simple ingredients such as eggs and American cheese magically transform from basic staples into a versatile composed dish was revelatory for a young Adam and ignited his fascination with the culinary world. 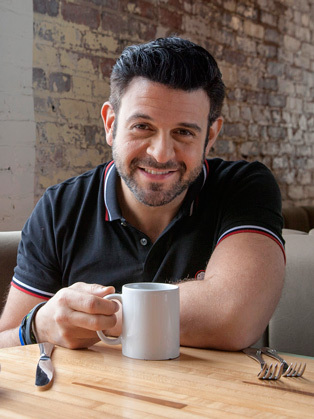 Building his TV résumé, subsequently Adam assumed hosting and co-executive producing duties on “Man V. Food Nation,” “Adam Richman’s Best Sandwich in America,” “Fandemonium,” “Man Finds Food,” (2015) and “Secret Eats with Adam Richman,”(2016) on Travel Channel. In 2014, Adam hosted NBC’s successful food competition show “Food Fighters,” which aired for two seasons. Under his production company banner, County of Kings, and in conjunction with Whizz Kidd Entertainment, he co-created and co-executive produced “BBQ Champ” for ITV in the UK in 2015. It has since aired across New Zealand, Asia, Italy and Canada, and as a localized adaptation in Brazil. Adam’s first book, America the Edible (Rodale Publishing, 2010), offered a behind-the-scenes look at his adventures traveling – and eating, of course - across the US. In 2015, inspired by the many great cuisines sampled during his travels, Adam penned his first cookbook, Straight Up Tasty (Clarkson Potter), featuring his signature take on globally-inspired comfort food. Always restlessly creative, Adam has drawn upon his fine arts roots to act in numerous theater productions in New York City, and has appeared on a wide range of TV shows. In 2016, he co- produced the New York and London runs of the play, Stalking the Bogeyman.